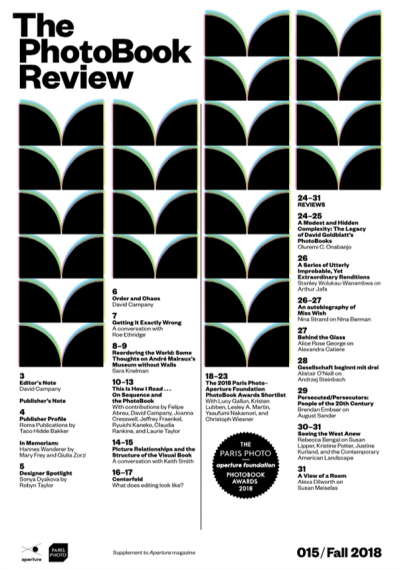 David Campany is guest editor of Aperture’s The Photobook Review, issue 15. Its theme is image editing. Centerfold What does editing look like? For some photographers, editing is the heart of the matter, the place where the real work is done, and a source of great pleasure. For others it is secondary, or a problem, and may even lead to anguish. But unless the photographs are absolutely singular, with no intended relation to any others, sooner or later there will be editing. If the photographer does not do it, someone else will have to. And there is certainly no such thing as a photobook without editing. It was in the 1920s, with the flourishing of the illustrated press and the growth of popular cinema, that the role of editing became crucial to visual culture. All those images had to be sifted and arranged. The tasks of editing were soon professionalized in various ﬁelds, each according to their media-speciﬁc needs, including magazine and book publishing, ﬁlmmaking, and art history. Conventions for selecting and sequencing were established by the mainstream press and cinema, and rejected or subverted by the various avant-gardes wanting alternatives from society, from images, or both. And in that rich setting, new kinds of photographic books emerged that were more emphatic in their choice and arrangement of images than mere collections of individual pictures. Where ﬁlmmakers and ﬁlm critics worked up sophisticated theories of editing, still photographers did not. There is no photographic equivalent, for example, of the 1920s Soviet theories of montage developed by Sergei Eisenstein, Lev Kuleshov, and Dziga Vertov (all men, although the unsung heroine from that period is Elizaveta Svilova, who edited and appears in Vertov’s 1929 ﬁlm Man with a Movie Camera, a work every editor of movies or photographs should see). It is surprising how rarely any of the great photo editors of the last century—Stefan Lorant of Picture Post and Lilliput magazines, John G. Morris of Life magazine, or Robert Delpire, to name just a few—spoke or wrote with any real insight about how they worked. Two unusual exceptions were actually art historians, Aby Warburg and André Malraux, although neither paid much attention to photography beyond how it reproduces and arranges all the other arts on the page. Warburg’s highly idiosyncratic methods, arranging diverse images on panels to explore multidirectional afﬁnities and themes, are discussed widely today. Sara Knelman considers Malraux’s highly inﬂuential and highly manipulative books of art reproductions for this issue of The PhotoBook Review. Illustrated art history books are rarely considered “photobooks,” but there’s every reason they should be. Another key voice has been Keith Smith, whose 1984 study Structure of the Visual Book remains one of the few sustained attempts to think through the relations between images. You’ll ﬁnd Aperture editor Lesley Martin’s exchange with Smith here, too. Is it possible to express what happens in the mind when one photograph is placed next to another, and another, across pages? Are there theories that editors of photographs work with? Working assumptions? Unwritten rules? Or are there just private preferences? Does the role and task of an editor shift signiﬁcantly if editing for the front page of a newspaper, or a magazine essay, versus an artist’s own book? Can the craft of an editor be recognized, like a signature style, or does it disappear in the result? Does an editor know why they think one arrangement “works” and another does not? Can they articulate it? Can editing procedures be classiﬁed, and named? There was a moment in the 1960s and ’70s when it seemed image editing would be approached theoretically. Structuralism, semiotics, and the revival of interest in rhetoric in French and British academies transformed the way culture was thought about. Methods ﬁrst developed for studying language were applied to images, with highly suggestive results (notably Roland Barthes’s early writings on photography, and Judith Williamson’s Decoding Advertisements in 1978). Complex theories of narrative structure emerged as ways to understand everything from folktales to Hollywood cinema. But something about the arrangement of still images seemed to resist scrutiny. Beyond photography’s attempts at linear storytelling or radical juxtaposition (both of which are usually pretty creaky), analysis seemed to hit a brick wall. This didn’t prevent extraordinary things being done with the editing of images. On the contrary, the 1960s and ’70s saw the second great expansion of experimental approaches, which are still inﬂuential. Think of the diverse publications of Hans-Peter Feldmann, Martha Rosler, Allan Sekula, Edward Ruscha, or John Baldessari. But at the same time, photography was entering the museum largely on the basis of exemplary single images, not even bodies of work, and this also stalled critical discussion at the borders of the image. There were deeper difﬁculties, too. Most combinations of photographs are more like poetry than prose. For all that they show and express, they also announce their gaps, indirections, and enigmas. They do not explain effectively and are not very good at argument. Instead, image combinations suggest. In their punctuated way, they do not have the ﬂow that can be attained by cinema and some types of literature. The individual images never entirely overcome their essential isolation from each other. There is always a tension—aesthetic, cognitive, intellectual—between what is irreducibly singular about a photograph and the part it plays in the larger whole. This is the challenge and the pleasure that photo editing presents. It is also the reason why analyzing it proves difﬁcult. Only vague things can be said about it in general, so the more speciﬁc one can get, the better. There can be no overarching theory. The range of ways that images are put together today is wide, especially in book form, which for many photographers has now come to be the space in which comprehensive expression of an artistic vision is most possible. Everything, it seems, is being dared and tried. Why? Well, these are strange and desperate times, and who knows what works best, and what forms best express an age of uncertainty? Moreover, there is barely a mainstream of photo editing conventions anymore—certainly not of the kind that was established by the mass-market magazine photo-story that dominated for decades. Today there is no ﬁxed order to kick against. If there is a mainstream, it is that mutating ﬂow in which the order of images experienced daily is more likely to be determined by the algorithms of ideology, preference, taste, and commerce than by a conscious mind, let alone a creative or critical one. When any image might relate vaguely to any other, the very gesture of locking down a sequence in print, once and for all, which almost any photobook demands, can seem like a small act of resistance. David Campany is a curator and writer based in London.